Autodesk researcher Andreas Bastian displays how lightweight the new seat frame is. Additionally, 3D printing is limited to the relatively small size of a print beds - only a few feet in size -- even in commercial machines. Traditional metal casting has nearly limitless production scalability. The magnesium seat frame created using a CAD program, a 3D printer and traditional metal casting techniques. On the right is the intricate latticework that resulted in a vastly lighter, yet strong seat frame. Autodesk and Aristo Cast claim that if an aircraft maker such as Airbus were to replace all 615 seats on its A380 jets with the new, lighter magnesium seat frames -- across a fleet of 100 planes which typically have a 20-year lifespan -- the move would save $206 million, based on average jet fuel costs in 2015. Along with reducing fuel costs, the new seats could also mean 126,000 fewer tons of C02 emissions if used on a single model aircraft. "While additive manufacturing holds great promise for the future of manufacturing, it's still very new for many product developers. Casting, by contrast, has been around for millennia and is incredibly well understood," Autodesk research scientist Andreas Bastian said in a statement. "There are hundreds of thousands of engineers, foundries, and factories with deep expertise in it. That's one of the reasons I am looking for a bridge between the two." For the past year, Bastian has been working at Autodesk's 27,000-square-foot technology center in San Francisco to produce the lighter airline seat. 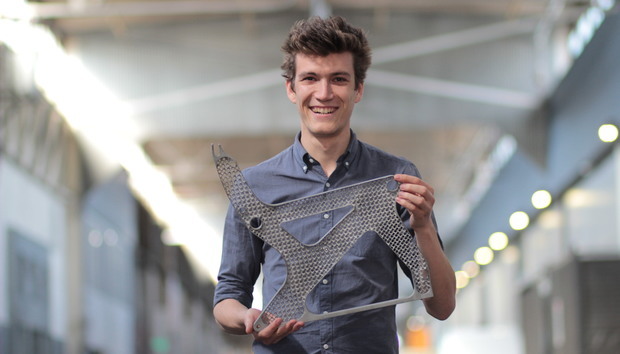 Bastian used the algorithms in the Netfabb 3D design software to create an intricate latticework that resulted in a seat just as strong. "We leapt at the opportunity to work with Andreas and Autodesk. It's an exciting project and allowed us to pioneer some new techniques for magnesium casting," Paul Leonard, Aristo Cast's chief engineer, said in a statement. "It also gave us a chance to learn more about advanced design and optimization techniques. That's still quite new in our industry." Aristo Cast workers remove e metal casted airline seats. What is also unique about Autodesk and Aristo Cast's proof-of-concept project is they not only reduced an airline seat weight with a more sophisticated frame design, but they were able to cast in magnesium -- no simple task. Fuel and carbon emission reductions based on using the new magnesium airline seats. Typically, aluminum is used for airplane seats, but magnesium is 35% lighter. Autodesk's 3D design optimization resulted in more than half of the weight reduction and the magnesium accounted for the rest, Autodesk claims. "We've seen a lot foundries in our region shutter their doors in recent years as manufacturing moves overseas," Aristo Cast's CEO, Jack Ziemba, said in a statement. "We see adopting new techniques like additive manufacturing, even when blended with our expertise in casting, as a way forward -- not just for our company but for lots of other foundries in the Midwest."